Poised atop a bluff along the Lake Michigan shore, sits quaint St. Joseph, one of Michigan's featured beach towns. Brick streets welcome visitors downtown to relax as they browse through unique shops and enjoy dining in this resort town. Poised below the town is Silver Beach, with its sugary sands that spread 1600 feet along the Lake Michigan shoreline. 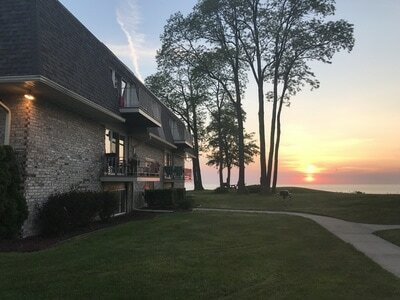 Majestic Getaways offers two beachfront units which enjoy beautiful views of Lake Michigan and a convenient location close to town. Each condo is completely furnished and offers matching kitchenware, bath and bed linens, and a bright color scheme. Onsite pool and private beach await you for your perfect beach town living experience!